This beautiful American made dining chair is handcrafted using handpicked solid wood. It is finished with care for a magnificent dining room appeal. This chair is available with either a wood or fabric seat. 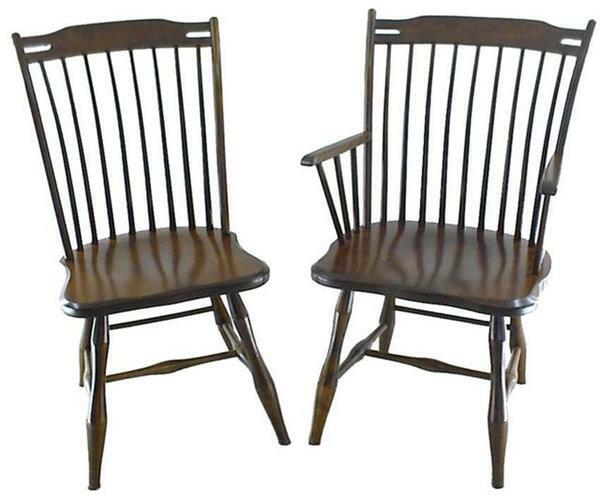 All dining room chairs are steam bent and feature a molded seat and tilt back. Order in your choice of oak, which is standard, cherry, hickory, maple, walnut, quartersawn white oak, or brown maple. Every chair is one of a kind and made to order for your home. Available in an armchair or side chair, you will have plenty of space to stretch out in our Amish Classic Lansing Dining Chair. The side chair has an 8 spindle back splat while the armchair has 9. Family and guests alike will feel comfortable and able to enjoy company for hours on end. Our Lansing Dining Chair offers the opportunity to enjoy an American classic in your home for decades to come. Feel free to get in touch by giving us a ring at 866-272-6773. We look forward to hearing from you! Back Height Above Seat: 21"
Seat Depth at Post: 11"
Seat Depth at Center: 15 1/2"
Width Between Arms: 18 1/2"
Seat Depth at Post: 11 5/8"
Seat Depth at Center: 16 1/4"